Update: oops, it looks like my script below works only in simple cases where you just one actor proxy. The ActorID seems to be a constant (perhaps unused???) and it looks like you have to take the point ID and then look up the corresponding entry in the CrowdFX_Actor_Indices array. 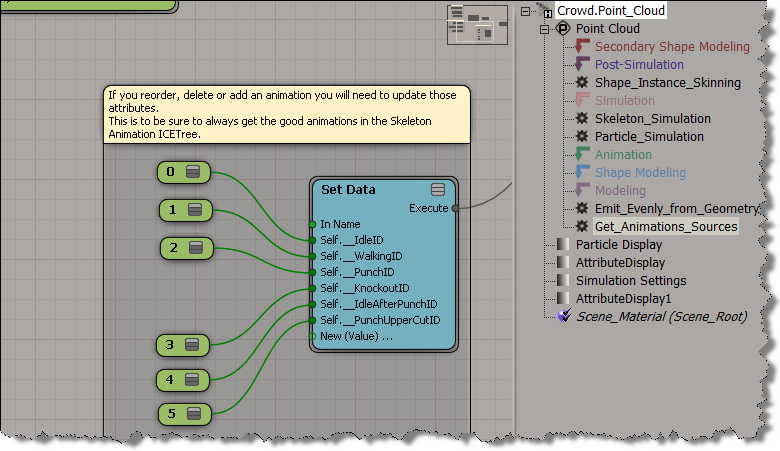 If you need to get info like the actor ID, the X and Z positions, and the animation frame from CrowdFX, you can get it from the Simulation Cloud. Here’s a little Python snippet that logs a comma-separated string that contains the Actor ID, X, and Z positions, PoseID, and CurrentFrameInPose. Note the use of the logf function from the sipyutils. The Foo Fighter pose state IDs are set here (there are actually eight Action Sources in the ActorProxy property, but not all of them are used). 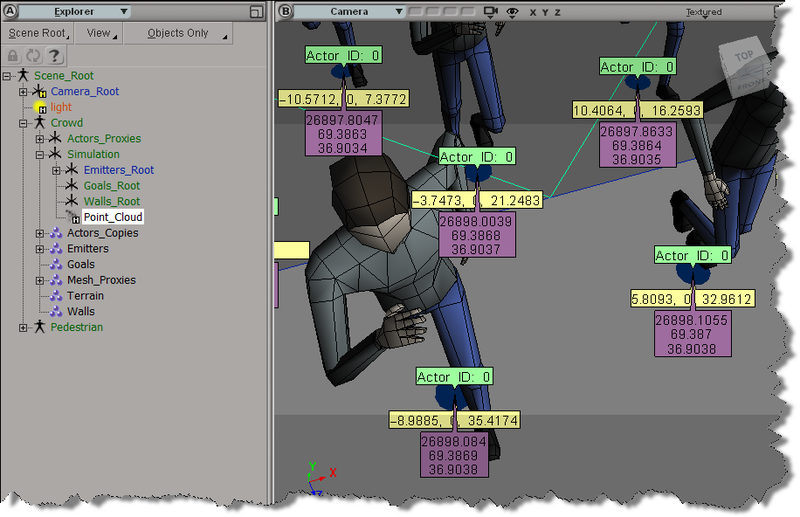 BTW, is it just me, or do the Attribute Display properties not work with the sample CrowdFX scenes? I was using the Foo Fighters sample at first, but I wasn’t able to show any attribute values, which made it a little harder to figure out what info was where. This entry was posted in ICE, ICE CrowdFX, Python, Scripting and tagged CrowdFX, ICE, Python, Softimage by xsisupport. Bookmark the permalink. thanx alot for these usefull tutorials, really helped..
now we’re working on war scenes in amovie..were there are lots of horses and elephants..
1: we had some problems in rotating actors”Horses” with the terrain..
2: we cannot re-export the fbx cached file to 3ds max with proper unwrap again..